Are these socks? Or are these sneakers? Now introducing the new Skinners! Skinners are the ultraportable footwear for any adventure. 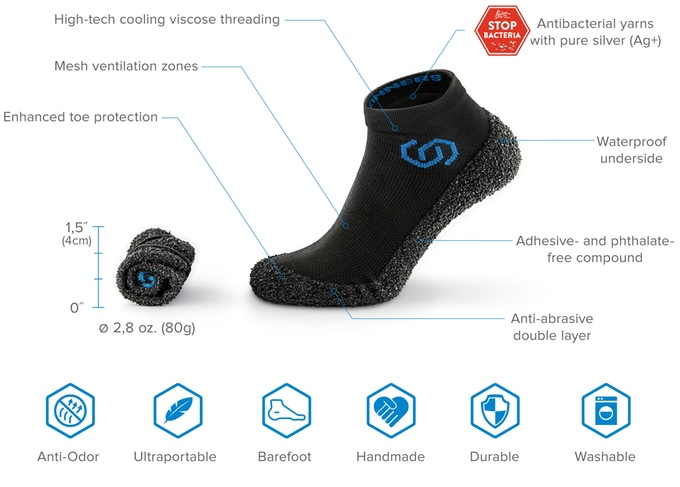 Made with cooling viscose threads, with an anti abrasive double layer along with waterproof underside, these skinners do make a really good deal. Phrases like anti-odour, ultraportable, comfortable, durable, washable go along with skinners. They can be easily folded and carried everywhere. Running, hiking, roller-blading or gymming: name it and you can wear it! It also available in different sizes and colours but the comfort levels remain unchanged.